Last March I received a note from Steve Scott. 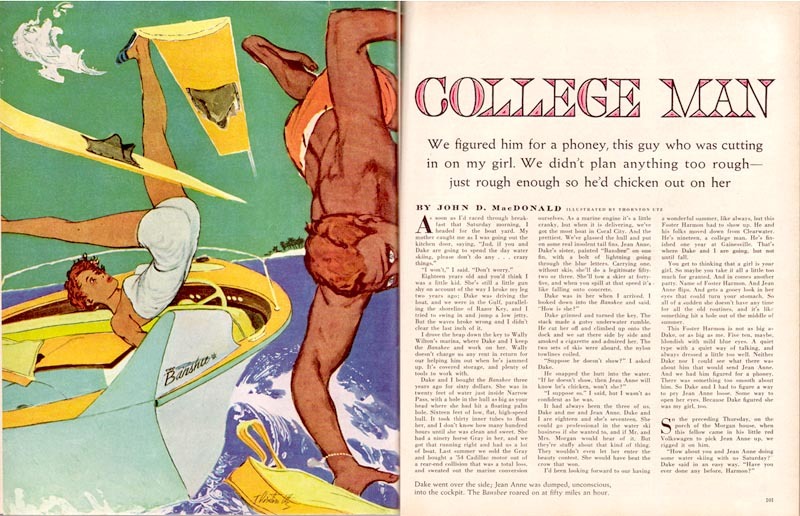 It began, "I write a blog on author John D MacDonald, a guy who wrote hundreds of short stories for magazines of the forties and fifties, and I own a pile of old magazines containing his work." "Mostly I simply use scans of old covers -- ones I own or ones I found on the web -- but I occasionally do the inside magazine artwork if I can. 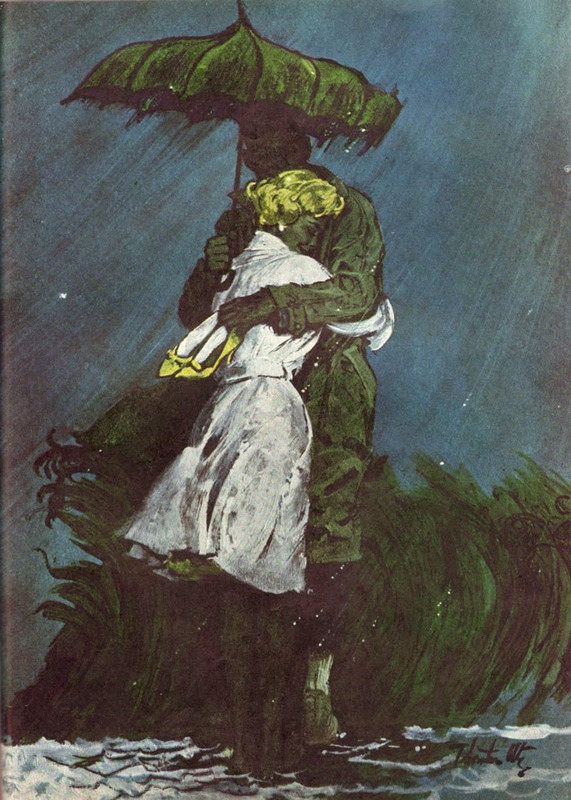 I have to confess that I already nicked a couple of your scans for my blog: Thornton Utz's "Hangover" and Arpie Ermoyan's "The Trouble with Erica." Steve continued, "I'd be happy to send you copies of anything I scan for use on your blog, assuming I don't already see it in your collection." 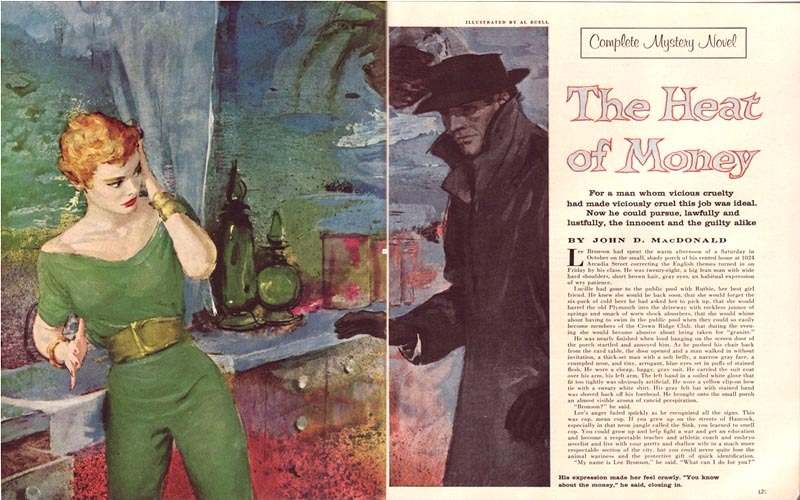 And not long thereafter, Steve sent some really terrific images by one of my favourite mid-century illustrators, Thornton Utz. Its those images which decorate today's post. Steve explained, "I started wondering how I learned [about] the friendship between Utz and MacDonald. 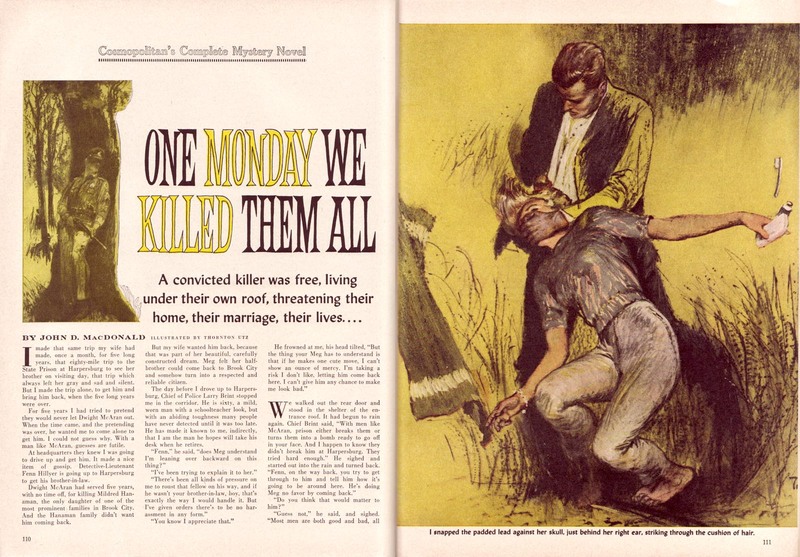 A little digging and I uncovered the April 1957 issue of Cosmopolitan. It's their Florida issue and it contains the attached photo of Utz, MacDonald and yet another artist neighbor, Al Buell." "This issue features a MacDonald work illustrated by Buell..."
"... plus another Utz work illustrating a story by Thornton Delehanty." Steve concludes, "I'm sure to come across more illustrations by this great artist and I'll be sure to forward them on to you when I do." Many thanks, Steve! 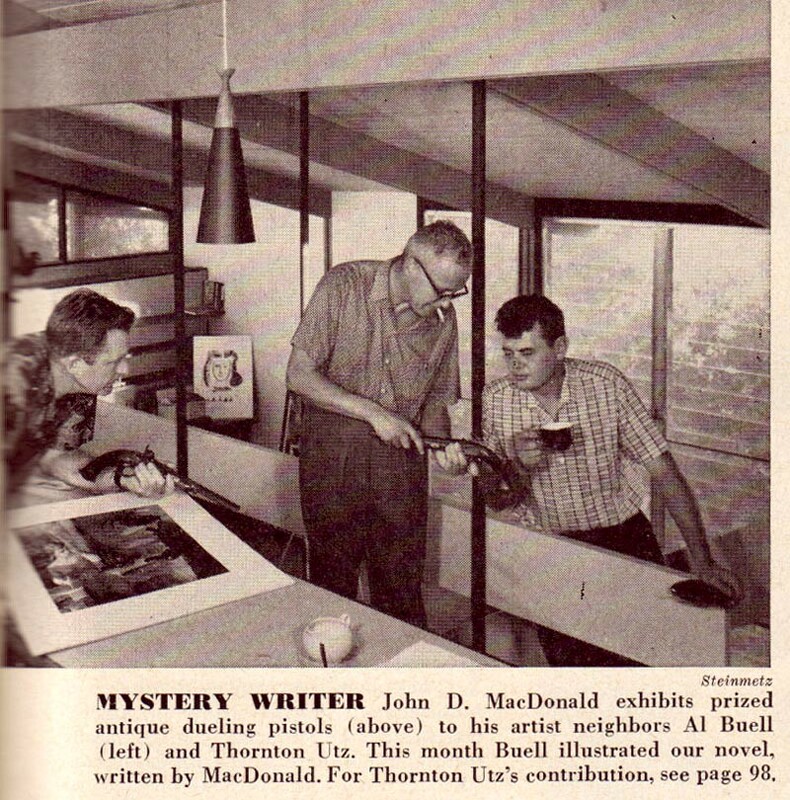 Besides seeing once again what a versatile illustrator Utz was, its interesting to discover that he, Al Buell and John D. MacDonald were close friends and neighbours. * Steve's blog is called The Trap of Solid Gold, named after a John D. MacDonald short story. Be sure to drop by there and check it out! Didya ever see a set of gams painted better than that! Fun in the Sun..wowsa. I love the photo too. Classic mid-century architecture / interior design to go with the classic mid-century illustrations!